June is scoliosis awareness month. Scoliosis is a condition which causes a curvature in the spine. Idiopathic scoliosis is most commonly seen in girls with a family history of the condition, between the ages of 10 and 12; however, anyone can be impacted by the condition. While it is a rare condition, you should consider a routine screening for younger children. If left untreated, the curve can worsen and even restrict heart and lung function. The spine stiffens as we age, making it more difficult to treat scoliosis in later years. Children are often screened at school, but knowing some of the signs and symptoms of scoliosis can help with early intervention and treatment plans. When preparing a child for a scoliosis screening, it is important to reassure them that the test is painless. They are often in a private room and will not have to be exposed to their classmates or teachers. If the screening is positive, the examiner will recommend that a more thorough examination should happen with your doctor. The doctor will perform more in-depth testing, including an x-ray to confirm the presence of scoliosis. Even an untrained professional can notice the signs and symptoms of scoliosis. If you notice that your child has uneven shoulders or hips, you may want to make an appointment with their doctor to have them fully tested. 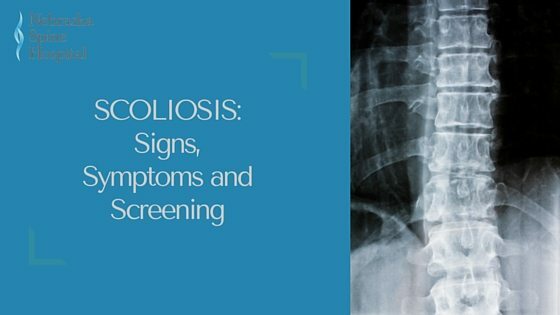 Once tested, the doctor can tell you if scoliosis is present. If it is, the doctor will then let you know what the best treatment path would be. In some cases, a brace or surgery is needed to straighten the spine, while in other cases, the doctor may suggest simply monitoring your child’s growth and spine. Scoliosis is primarily viewed as a physical condition. But, those that suffer from untreated scoliosis often talk about the emotional toll it takes, as well. They report feeling self-conscious about their looks and dealing with the pain they endure because of the condition. Some people report struggling with simple tasks like sitting at a desk or choosing what clothes to wear for the day. The good news is that children diagnosed with idiopathic scoliosis can be treated. It is important to catch scoliosis early so that treatment occurs sooner and the pain of advanced scoliosis can be avoided. If you have questions about screening, diagnosis, or treatment of scoliosis, you can contact our Nurse Navigator for help!